The largest Terrier of the Terrier Group. The first Airedales looked completely different from the Airedales of today. They were originally known as the Waterside and Bingley Terriers, descended from the now extinct black-and-tan type terrier and mixed with Otterhounds to help develop the Airedale as a better swimmer to hunt otters in the rivers and rats on land. It is also said to have Manchester Terrier in its blood. They were developed about a hundred years ago in the country of York from the ancient Working Terrier. The Airedale is often called "The King of Terriers." The breed was used as a vermin hunter and was named for the Valley of the Aire in England, which was heavily populated with small game. In addition to his role as a small game hunter, the Airedale has been used to hunt big game in India, Africa and Canada. The breed was also used as a police dog and a wartime guard in World War II. Today the Airedale is primarily a companion dog, but there are still working lines out there. Some of the Airedale's talents are guarding, watchdog, hunting, rodent control, tracking, military work, police work and competitive obedience and flyball. •	Athletic, lots of drive, energy and stamina. •	They are also fun-loving and known to be comical. •	Like all Terriers, Airedales have a natural inclination to chase small animals, dig and bark. •	Airedales are a high-energy working dog therefore need daily exercise. •	They are known to remain active and full of energy throughout their life. •	Not suited to apartment life unless you are committed to consistent exercise outdoors every day. •	Best suited for homes with a large, fenced yard. •	Chewing can be a favorite Airedale habit. •	A fairly independent dog, but enjoy being a member of a family. •	Happiest when inside with his owners, and is not meant to be a backyard dog. •	Airedale Terriers are very good with children and are fondly called reliable babysitters. ....however, should never be left unsupervised with small children. •	Low shedders, a great choice for those with dog hair allergies. Plan on paying a professional groomer or learn to groom your Airedale yourself. The Airedale Terrier is a very lively and energetic terrier that does have the tendency to be the dominant dog as well as the leader in the family if not properly trained and socialized. They are extremely intelligent and will quickly learn both commands and how to get out following commands so firm and consistent training is a must. The Airedale Terrier is a good family dog and will interact well with children of all ages. Since they are a large terrier they do need to be taught not to be overly possessive of toys or food as well as to avoid snapping when teased or irritated. Teaching children to respect this dog and to watch when the dog has simply had enough is very important. As with all terriers the Airedale Terrier has an independent and rather headstrong streak that can become a problem during training. Typically this is worse in intact males that have not been obedience trained and have had little socialization as a puppy. It is important to purchase an Airedale Terrier from a breeder that starts early socialization and can provide information on the tendencies of the breed. While an excellent obedience dog when trained, they are not always a good choice for a first time dog owner that wishes to raise a dog from a puppy. An Airedale Terrier from a rescue that is already trained and has learned the basics may be a better choice. The Airedale Terrier can learn to get along with other pets although some simply have difficulty living in the same house with other non-canine pets. Puppies are generally more accepting of cats than mature dogs that have not had cats in the house. The Airedale Terrier will be a good companion dog to a non-dominant breed but two dominant type breeds will fight. Spaying and neutering and choosing a companion dog of the opposite gender that is also spayed or neutered is the best possible option. Most terrier breeds are very healthy dogs and the Airedale Terrier is no exception. Despite the short, wiry wavy and dense outer coat and the thick, woolly undercoat shedding can be minimized with the Airedale Terrier with regular stripping, a process of plucking the long, dead hairs from the coat. Without stripping and regular, three to four times weekly brushing the Airedale Terrier is a moderate to heavy shedder and the coat may be prone to matting and tangling. Grooming the Airedale Terrier usually requires a grooming rake or pin bristle brush followed by a stiff bristle brush. It is important to brush the undercoat, not just the wiry overcoat as the undercoat is where the mats are most likely to be found. Check between the pads of the feet, behind the front legs and around the rump area to remove any mats or debris that can lead to the formation of mats. It is also important to wipe and wash the beard after eating as the longer, stiff hairs will trap food and this can lead to discoloration as well as a bad odor. The Airedale Terrier requires a lot of space for exercise, however they will self-exercise like most terriers. They will run and explore the yard as well as patrol the perimeter as a watchdog. The Airedale Terrier loves to run and romp with the family and they enjoy games and just being involved in what is going on. 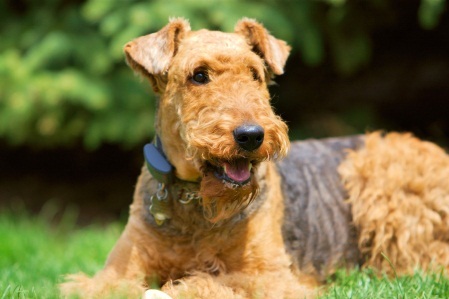 Airedale Terriers typically enjoy games such as fetch, tag and even tug of war. Care needs to be taken to avoid engaging the dominant or independent Airedale Terrier in games of strength such as tug of war as this may reinforce the dog's dominance or willingness to compete with the owner. Consider playing games such as fetch, hide and seek or even jogging or running with the dog to give it exercise as well as avoid any dominance building activities with the dog. Using the Airedale Terrier in competitions such as agility and obedience is a great way to provide both exercise as well as mental stimulation. Airedale Terriers that don't have enough challenge mentally and physically in their lives have a tendency to become destructive. This is often displayed by chewing, digging and barking, including tearing things apart inside the house and even outside in the yard. With proper exercise and training the Airedale Terrier will be well behaved and well mannered in the house and can tolerate some time alone provided exercise is provided before they are left. Since the Airedale Terrier may be somewhat dog aggressive and may also have a tendency to chase other dogs, cats or animals it is essential to keep them on a leash when outside of the fenced yard. As a hunting dog they may tend to get so involved in the hunt they simply don't respond when called to return. The Airedale Terrier is a strong, intelligent and very alert dog that is capable of becoming an excellent dog for obedience and agility training provided they are treated fairly and consistently and have an owner that understands how to work with a dominant type of dog. They are not always easy to train often going through a period in the "teen years" of being very headstrong and willful, although they are not aggressive towards people they can become standoffish if treated harshly during training. Positive, consistent training is key with this breed as well as keeping them challenged both physically and mentally. The Airedale Terrier has a huge exercise requirement especially in their first two to three years. Training must follow a lengthy, intensive exercise time or the young dog or puppy will simply be too distracted to follow commands and will simply want to play. They are naturally very engaging dogs so it is important to not allow their clown-like behavior and enthusiasm for play detract from the training program. Often an obedience class is recommended by breeders to help the owners and dog learn to work together. The Airedale Terrier will learn good habits as well as bad and this can sometimes be challenging to correct. Training right the first way is much easier than retraining for a bad habit. The Airedale Terrier is a dominant breed of dog and can become dog aggressive if not socialized from a very early age. They also are a hunting dog and need early, supervised socialization with other types of pets if the owner is wanting a cat or bird in the house. Once socialized with non-canine pets they are playful and typically will do very well, however they will chase cats that aren't family pets at almost every opportunity.